"Reentry" redirects here. For other uses, see Reentry (disambiguation). Atmospheric entry is the movement of an object from outer space into and through the gases of an atmosphere of a planet, dwarf planet, or natural satellite. There are two main types of atmospheric entry: uncontrolled entry, such as the entry of astronomical objects, space debris, or bolides; and controlled entry (or reentry) of a spacecraft capable of being navigated or following a predetermined course. Technologies and procedures allowing the controlled atmospheric entry, descent, and landing of spacecraft are collectively termed as EDL. Crewed space vehicles must be slowed to subsonic speeds before parachutes or air brakes may be deployed. Such vehicles have kinetic energies typically between 50 and 1,800 megajoules, and atmospheric dissipation is the only way of expending the kinetic energy. The amount of rocket fuel required to slow the vehicle would be nearly equal to the amount used to accelerate it initially, and it is thus highly impractical to use retro rockets for the entire Earth reentry procedure. While the high temperature generated at the surface of the heat shield is due to adiabatic compression, the vehicle's kinetic energy is ultimately lost to gas friction (viscosity) after the vehicle has passed by. Other smaller energy losses include black-body radiation directly from the hot gases and chemical reactions between ionized gases. Ballistic warheads and expendable vehicles do not require slowing at reentry, and in fact, are made streamlined so as to maintain their speed. Furthermore, slow-speed returns to Earth from near-space such as parachute jumps from balloons do not require heat shielding because the gravitational acceleration of an object starting at relative rest from within the atmosphere itself (or not far above it) cannot create enough velocity to cause significant atmospheric heating. For Earth, atmospheric entry occurs at the Kármán line at an altitude of 100 km (62.14 mi / ~ 54 nautical mi) above the surface, while at Venus atmospheric entry occurs at 250 km (155.3 mi / ~135 nautical mi) and at Mars atmospheric entry at about 80 km (50 mi / ~ 43.2 nautical mi). Uncontrolled, objects reach high velocities while accelerating through space toward the Earth under the influence of Earth's gravity, and are slowed by friction upon encountering Earth's atmosphere. Meteors are also often travelling quite fast relative to the Earth simply because their own orbital path is different from that of the Earth before they encounter Earth's gravity well. Most controlled objects enter at hypersonic speeds due to their suborbital (e.g., intercontinental ballistic missile reentry vehicles), orbital (e.g., the Soyuz), or unbounded (e.g., meteors) trajectories. Various advanced technologies have been developed to enable atmospheric reentry and flight at extreme velocities. An alternative low velocity method of controlled atmospheric entry is buoyancy which is suitable for planetary entry where thick atmospheres, strong gravity, or both factors complicate high-velocity hyperbolic entry, such as the atmospheres of Venus, Titan and the gas giants. The concept of the ablative heat shield was described as early as 1920 by Robert Goddard: "In the case of meteors, which enter the atmosphere with speeds as high as 30 miles (48 km) per second, the interior of the meteors remains cold, and the erosion is due, to a large extent, to chipping or cracking of the suddenly heated surface. For this reason, if the outer surface of the apparatus were to consist of layers of a very infusible hard substance with layers of a poor heat conductor between, the surface would not be eroded to any considerable extent, especially as the velocity of the apparatus would not be nearly so great as that of the average meteor." Practical development of reentry systems began as the range and reentry velocity of ballistic missiles increased. For early short-range missiles, like the V-2, stabilization and aerodynamic stress were important issues (many V-2s broke apart during reentry), but heating was not a serious problem. Medium-range missiles like the Soviet R-5, with a 1,200-kilometer (650-nautical-mile) range, required ceramic composite heat shielding on separable reentry vehicles (it was no longer possible for the entire rocket structure to survive reentry). The first ICBMs, with ranges of 8,000 to 12,000 kilometers (4,300 to 6,500 nmi), were only possible with the development of modern ablative heat shields and blunt-shaped vehicles. In the United States, this technology was pioneered by H. Julian Allen and A. J. Eggers Jr. of the National Advisory Committee for Aeronautics (NACA) at Ames Research Center. In 1951, they made the counterintuitive discovery that a blunt shape (high drag) made the most effective heat shield. From simple engineering principles, Allen and Eggers showed that the heat load experienced by an entry vehicle was inversely proportional to the drag coefficient; i.e., the greater the drag, the less the heat load. If the reentry vehicle is made blunt, air cannot "get out of the way" quickly enough, and acts as an air cushion to push the shock wave and heated shock layer forward (away from the vehicle). Since most of the hot gases are no longer in direct contact with the vehicle, the heat energy would stay in the shocked gas and simply move around the vehicle to later dissipate into the atmosphere. The Allen and Eggers discovery, though initially treated as a military secret, was eventually published in 1958. Over the decades since the 1950s, a rich technical jargon has grown around the engineering of vehicles designed to enter planetary atmospheres. It is recommended that the reader review the jargon glossary before continuing with this article on atmospheric reentry. When atmospheric entry is part of a spacecraft landing or recovery, particularly on a planetary body other than Earth, entry is part of a phase referred to as entry, descent, and landing, or EDL. When the atmospheric entry returns to the same body that the vehicle had launched from, the event is referred to as reentry (almost always referring to Earth entry). The simplest axisymmetric shape is the sphere or spherical section. This can either be a complete sphere or a spherical section forebody with a converging conical afterbody. The aerodynamics of a sphere or spherical section are easy to model analytically using Newtonian impact theory. Likewise, the spherical section's heat flux can be accurately modeled with the Fay-Riddell equation. The static stability of a spherical section is assured if the vehicle's center of mass is upstream from the center of curvature (dynamic stability is more problematic). Pure spheres have no lift. However, by flying at an angle of attack, a spherical section has modest aerodynamic lift thus providing some cross-range capability and widening its entry corridor. In the late 1950s and early 1960s, high-speed computers were not yet available and computational fluid dynamics was still embryonic. Because the spherical section was amenable to closed-form analysis, that geometry became the default for conservative design. Consequently, manned capsules of that era were based upon the spherical section. Pure spherical entry vehicles were used in the early Soviet Vostok and Voskhod capsules and in Soviet Mars and Venera descent vehicles. The Apollo command module used a spherical section forebody heat shield with a converging conical afterbody. It flew a lifting entry with a hypersonic trim angle of attack of −27° (0° is blunt-end first) to yield an average L/D (lift-to-drag ratio) of 0.368. The resultant lift achieved a measure of cross-range control by offsetting the vehicle's center of mass from its axis of symmetry, allowing the lift force to be directed left or right by rolling the capsule on its longitudinal axis. Other examples of the spherical section geometry in manned capsules are Soyuz/Zond, Gemini, and Mercury. Even these small amounts of lift allow trajectories that have very significant effects on peak g-force (reducing g-force from 8–9g for a purely ballistic (slowed only by drag) trajectory to 4–5g) as well as greatly reducing the peak reentry heat. The original American sphere-cone aeroshell was the Mk-2 RV (reentry vehicle), which was developed in 1955 by the General Electric Corp. The Mk-2's design was derived from blunt-body theory and used a radiatively cooled thermal protection system (TPS) based upon a metallic heat shield (the different TPS types are later described in this article). The Mk-2 had significant defects as a weapon delivery system, i.e., it loitered too long in the upper atmosphere due to its lower ballistic coefficient and also trailed a stream of vaporized metal making it very visible to radar. These defects made the Mk-2 overly susceptible to anti-ballistic missile (ABM) systems. Consequently, an alternative sphere-cone RV to the Mk-2 was developed by General Electric. Mk-6 RV, Cold War weapon and ancestor to most of the U.S. missile entry vehicles. This new RV was the Mk-6 which used a non-metallic ablative TPS, a nylon phenolic. This new TPS was so effective as a reentry heat shield that significantly reduced bluntness was possible. However, the Mk-6 was a huge RV with an entry mass of 3,360 kg, a length of 3.1 m and a half-angle of 12.5°. Subsequent advances in nuclear weapon and ablative TPS design allowed RVs to become significantly smaller with a further reduced bluntness ratio compared to the Mk-6. Since the 1960s, the sphere-cone has become the preferred geometry for modern ICBM RVs with typical half-angles being between 10° to 11°. Reconnaissance satellite RVs (recovery vehicles) also used a sphere-cone shape and were the first American example of a non-munition entry vehicle (Discoverer-I, launched on 28 February 1959). The sphere-cone was later used for space exploration missions to other celestial bodies or for return from open space; e.g., Stardust probe. Unlike with military RVs, the advantage of the blunt body's lower TPS mass remained with space exploration entry vehicles like the Galileo Probe with a half angle of 45° or the Viking aeroshell with a half angle of 70°. Space exploration sphere-cone entry vehicles have landed on the surface or entered the atmospheres of Mars, Venus, Jupiter, and Titan. The DC-X, shown during its first flight, was a prototype single stage to orbit vehicle, and used a biconic shape similar to AMaRV. The biconic is a sphere-cone with an additional frustum attached. The biconic offers a significantly improved L/D ratio. A biconic designed for Mars aerocapture typically has an L/D of approximately 1.0 compared to an L/D of 0.368 for the Apollo-CM. The higher L/D makes a biconic shape better suited for transporting people to Mars due to the lower peak deceleration. Arguably, the most significant biconic ever flown was the Advanced Maneuverable Reentry Vehicle (AMaRV). Four AMaRVs were made by the McDonnell-Douglas Corp. and represented a significant leap in RV sophistication. Three AMaRVs were launched by Minuteman-1 ICBMs on 20 December 1979, 8 October 1980 and 4 October 1981. AMaRV had an entry mass of approximately 470 kg, a nose radius of 2.34 cm, a forward-frustum half angle of 10.4°, an inter-frustum radius of 14.6 cm, aft-frustum half angle of 6°, and an axial length of 2.079 meters. No accurate diagram or picture of AMaRV has ever appeared in the open literature. However, a schematic sketch of an AMaRV-like vehicle along with trajectory plots showing hairpin turns has been published. AMaRV's attitude was controlled through a split body flap (also called a split-windward flap) along with two yaw flaps mounted on the vehicle's sides. Hydraulic actuation was used for controlling the flaps. AMaRV was guided by a fully autonomous navigation system designed for evading anti-ballistic missile (ABM) interception. The McDonnell Douglas DC-X (also a biconic) was essentially a scaled-up version of AMaRV. AMaRV and the DC-X also served as the basis for an unsuccessful proposal for what eventually became the Lockheed Martin X-33. Non-axisymmetric shapes have been used for manned entry vehicles. One example is the winged orbit vehicle that uses a delta wing for maneuvering during descent much like a conventional glider. This approach has been used by the American Space Shuttle and the Soviet Buran. The lifting body is another entry vehicle geometry and was used with the X-23 PRIME (Precision Recovery Including Maneuvering Entry) vehicle. The FIRST (Fabrication of Inflatable Reentry Structures for Test) system was an Aerojet proposal for an inflated-spar Rogallo wing made up from Inconel wire cloth impregnated with silicone rubber and silicon carbide dust. FIRST was proposed in both one-man and six-man versions, used for emergency escape and reentry of stranded space station crews, and was based on an earlier unmanned test program that resulted in a partially successful reentry flight from space (the launcher nose cone fairing hung up on the material, dragging it too low and fast for the thermal protection system (TPS), but otherwise it appears the concept would have worked; even with the fairing dragging it, the test article flew stably on reentry until burn-through). The proposed MOOSE system would have used a one-man inflatable ballistic capsule as an emergency astronaut entry vehicle. This concept was carried further by the Douglas Paracone project. While these concepts were unusual, the inflated shape on reentry was in fact axisymmetric. Almost all aeronautical engineers are taught the perfect (ideal) gas model during their undergraduate education. Most of the important perfect gas equations along with their corresponding tables and graphs are shown in NACA Report 1135. Excerpts from NACA Report 1135 often appear in the appendices of thermodynamics textbooks and are familiar to most aeronautical engineers who design supersonic aircraft. The perfect gas theory is elegant and extremely useful for designing aircraft but assumes that the gas is chemically inert. From the standpoint of aircraft design, air can be assumed to be inert for temperatures less than 550 K at one atmosphere pressure. The perfect gas theory begins to break down at 550 K and is not usable at temperatures greater than 2,000 K. For temperatures greater than 2,000 K, a heat shield designer must use a real gas model. An entry vehicle's pitching moment can be significantly influenced by real-gas effects. Both the Apollo CM and the Space Shuttle were designed using incorrect pitching moments determined through inaccurate real-gas modelling. The Apollo-CM's trim-angle angle of attack was higher than originally estimated, resulting in a narrower lunar return entry corridor. The actual aerodynamic center of the Columbia was upstream from the calculated value due to real-gas effects. On Columbia's maiden flight (STS-1), astronauts John W. Young and Robert Crippen had some anxious moments during reentry when there was concern about losing control of the vehicle. An equilibrium real-gas model assumes that a gas is chemically reactive, but also assumes all chemical reactions have had time to complete and all components of the gas have the same temperature (this is called thermodynamic equilibrium). When air is processed by a shock wave, it is superheated by compression and chemically dissociates through many different reactions. Direct friction upon the reentry object is not the main cause of shock-layer heating. It is caused mainly from isentropic heating of the air molecules within the compression wave. Friction based entropy increases of the molecules within the wave also account for some heating. [original research?] The distance from the shock wave to the stagnation point on the entry vehicle's leading edge is called shock wave stand off. An approximate rule of thumb for shock wave standoff distance is 0.14 times the nose radius. One can estimate the time of travel for a gas molecule from the shock wave to the stagnation point by assuming a free stream velocity of 7.8 km/s and a nose radius of 1 meter, i.e., time of travel is about 18 microseconds. This is roughly the time required for shock-wave-initiated chemical dissociation to approach chemical equilibrium in a shock layer for a 7.8 km/s entry into air during peak heat flux. Consequently, as air approaches the entry vehicle's stagnation point, the air effectively reaches chemical equilibrium thus enabling an equilibrium model to be usable. For this case, most of the shock layer between the shock wave and leading edge of an entry vehicle is chemically reacting and not in a state of equilibrium. The Fay-Riddell equation, which is of extreme importance towards modeling heat flux, owes its validity to the stagnation point being in chemical equilibrium. The time required for the shock layer gas to reach equilibrium is strongly dependent upon the shock layer's pressure. For example, in the case of the Galileo Probe's entry into Jupiter's atmosphere, the shock layer was mostly in equilibrium during peak heat flux due to the very high pressures experienced (this is counterintuitive given the free stream velocity was 39 km/s during peak heat flux). Determining the thermodynamic state of the stagnation point is more difficult under an equilibrium gas model than a perfect gas model. Under a perfect gas model, the ratio of specific heats (also called isentropic exponent, adiabatic index, gamma, or kappa) is assumed to be constant along with the gas constant. For a real gas, the ratio of specific heats can wildly oscillate as a function of temperature. Under a perfect gas model there is an elegant set of equations for determining thermodynamic state along a constant entropy stream line called the isentropic chain. For a real gas, the isentropic chain is unusable and a Mollier diagram would be used instead for manual calculation. However, graphical solution with a Mollier diagram is now considered obsolete with modern heat shield designers using computer programs based upon a digital lookup table (another form of Mollier diagram) or a chemistry based thermodynamics program. The chemical composition of a gas in equilibrium with fixed pressure and temperature can be determined through the Gibbs free energy method. Gibbs free energy is simply the total enthalpy of the gas minus its total entropy times temperature. A chemical equilibrium program normally does not require chemical formulas or reaction-rate equations. The program works by preserving the original elemental abundances specified for the gas and varying the different molecular combinations of the elements through numerical iteration until the lowest possible Gibbs free energy is calculated (a Newton-Raphson method is the usual numerical scheme). The data base for a Gibbs free energy program comes from spectroscopic data used in defining partition functions. Among the best equilibrium codes in existence is the program Chemical Equilibrium with Applications (CEA) which was written by Bonnie J. McBride and Sanford Gordon at NASA Lewis (now renamed "NASA Glenn Research Center"). Other names for CEA are the "Gordon and McBride Code" and the "Lewis Code". CEA is quite accurate up to 10,000 K for planetary atmospheric gases, but unusable beyond 20,000 K (double ionization is not modelled). CEA can be downloaded from the Internet along with full documentation and will compile on Linux under the G77 Fortran compiler. A non-equilibrium real gas model is the most accurate model of a shock layer's gas physics, but is more difficult to solve than an equilibrium model. As of 1958[update], the simplest non-equilibrium model was the Lighthill-Freeman model. The Lighthill-Freeman model initially assumes a gas made up of a single diatomic species susceptible to only one chemical formula and its reverse; e.g., N2 ? N + N and N + N ? N2 (dissociation and recombination). Because of its simplicity, the Lighthill-Freeman model is a useful pedagogical tool, but is unfortunately too simple for modelling non-equilibrium air. Air is typically assumed to have a mole fraction composition of 0.7812 molecular nitrogen, 0.2095 molecular oxygen and 0.0093 argon. The simplest real gas model for air is the five species model, which is based upon N2, O2, NO, N, and O. The five species model assumes no ionization and ignores trace species like carbon dioxide. When running a Gibbs free energy equilibrium program,[clarification needed] the iterative process from the originally specified molecular composition to the final calculated equilibrium composition is essentially random and not time accurate. With a non-equilibrium program, the computation process is time accurate and follows a solution path dictated by chemical and reaction rate formulas. The five species model has 17 chemical formulas (34 when counting reverse formulas). The Lighthill-Freeman model is based upon a single ordinary differential equation and one algebraic equation. The five species model is based upon 5 ordinary differential equations and 17 algebraic equations. Because the 5 ordinary differential equations are tightly coupled, the system is numerically "stiff" and difficult to solve. The five species model is only usable for entry from low Earth orbit where entry velocity is approximately 7.8 km/s (28,000 km/h; 17,000 mph). For lunar return entry of 11 km/s, the shock layer contains a significant amount of ionized nitrogen and oxygen. The five species model is no longer accurate and a twelve species model must be used instead. Atmospheric reentry interface velocities on a Mars–Earth trajectory are on the order of 12 km/s (43,000 km/h; 27,000 mph) Modeling high speed Mars atmospheric entry—which involves a carbon dioxide, nitrogen and argon atmosphere—is even more complex requiring a 19 species model. An important aspect of modelling non-equilibrium real gas effects is radiative heat flux. If a vehicle is entering an atmosphere at very high speed (hyperbolic trajectory, lunar return) and has a large nose radius then radiative heat flux can dominate TPS heating. Radiative heat flux during entry into an air or carbon dioxide atmosphere typically comes from asymmetric diatomic molecules; e.g., cyanogen (CN), carbon monoxide, nitric oxide (NO), single ionized molecular nitrogen etc. These molecules are formed by the shock wave dissociating ambient atmospheric gas followed by recombination within the shock layer into new molecular species. The newly formed diatomic molecules initially have a very high vibrational temperature that efficiently transforms the vibrational energy into radiant energy; i.e., radiative heat flux. The whole process takes place in less than a millisecond which makes modelling a challenge. The experimental measurement of radiative heat flux (typically done with shock tubes) along with theoretical calculation through the unsteady Schrödinger equation are among the more esoteric aspects of aerospace engineering. Most of the aerospace research work related to understanding radiative heat flux was done in the 1960s, but largely discontinued after conclusion of the Apollo Program. Radiative heat flux in air was just sufficiently understood to ensure Apollo's success. However, radiative heat flux in carbon dioxide (Mars entry) is still barely understood and will require major research. The frozen gas model describes a special case of a gas that is not in equilibrium. The name "frozen gas" can be misleading. A frozen gas is not "frozen" like ice is frozen water. Rather a frozen gas is "frozen" in time (all chemical reactions are assumed to have stopped). Chemical reactions are normally driven by collisions between molecules. If gas pressure is slowly reduced such that chemical reactions can continue then the gas can remain in equilibrium. However, it is possible for gas pressure to be so suddenly reduced that almost all chemical reactions stop. For that situation the gas is considered frozen. The distinction between equilibrium and frozen is important because it is possible for a gas such as air to have significantly different properties (speed-of-sound, viscosity etc.) for the same thermodynamic state; e.g., pressure and temperature. Frozen gas can be a significant issue in the wake behind an entry vehicle. During reentry, free stream air is compressed to high temperature and pressure by the entry vehicle's shock wave. Non-equilibrium air in the shock layer is then transported past the entry vehicle's leading side into a region of rapidly expanding flow that causes freezing. The frozen air can then be entrained into a trailing vortex behind the entry vehicle. Correctly modelling the flow in the wake of an entry vehicle is very difficult. Thermal protection shield (TPS) heating in the vehicle's afterbody is usually not very high, but the geometry and unsteadiness of the vehicle's wake can significantly influence aerodynamics (pitching moment) and particularly dynamic stability. A thermal protection system or TPS is the barrier that protects a spacecraft during the searing heat of atmospheric reentry. A secondary goal may be to protect the spacecraft from the heat and cold of space while in orbit. Multiple approaches for the thermal protection of spacecraft are in use, among them ablative heat shields, passive cooling, and active cooling of spacecraft surfaces. The ablative heat shield functions by lifting the hot shock layer gas away from the heat shield's outer wall (creating a cooler boundary layer). The boundary layer comes from blowing of gaseous reaction products from the heat shield material and provides protection against all forms of heat flux. The overall process of reducing the heat flux experienced by the heat shield's outer wall by way of a boundary layer is called blockage. Ablation occurs at two levels in an ablative TPS: the outer surface of the TPS material chars, melts, and sublimes, while the bulk of the TPS material undergoes pyrolysis and expels product gases. The gas produced by pyrolysis is what drives blowing and causes blockage of convective and catalytic heat flux. Pyrolysis can be measured in real time using thermogravimetric analysis, so that the ablative performance can be evaluated. Ablation can also provide blockage against radiative heat flux by introducing carbon into the shock layer thus making it optically opaque. Radiative heat flux blockage was the primary thermal protection mechanism of the Galileo Probe TPS material (carbon phenolic). Carbon phenolic was originally developed as a rocket nozzle throat material (used in the Space Shuttle Solid Rocket Booster) and for reentry-vehicle nose tips. Early research on ablation technology in the USA was centered at NASA's Ames Research Center located at Moffett Field, California. Ames Research Center was ideal, since it had numerous wind tunnels capable of generating varying wind velocities. Initial experiments typically mounted a mock-up of the ablative material to be analyzed within a hypersonic wind tunnel. Testing of ablative materials occurs at the Ames Arc Jet Complex. Many spacecraft thermal protection systems have been tested in this facility, including the Apollo, space shuttle, and Orion heat shield materials. SLA in SLA-561V stands for super light-weight ablator. SLA-561V is a proprietary ablative made by Lockheed Martin that has been used as the primary TPS material on all of the 70° sphere-cone entry vehicles sent by NASA to Mars other than the Mars Science Laboratory (MSL). SLA-561V begins significant ablation at a heat flux of approximately 110 W/cm², but will fail for heat fluxes greater than 300 W/cm². The MSL aeroshell TPS is currently designed to withstand a peak heat flux of 234 W/cm². The peak heat flux experienced by the Viking-1 aeroshell which landed on Mars was 21 W/cm². For Viking-1, the TPS acted as a charred thermal insulator and never experienced significant ablation. Viking-1 was the first Mars lander and based upon a very conservative design. The Viking aeroshell had a base diameter of 3.54 meters (the largest used on Mars until Mars Science Laboratory). SLA-561V is applied by packing the ablative material into a honeycomb core that is pre-bonded to the aeroshell's structure thus enabling construction of a large heat shield. NASA's Stardust sample return capsule successfully landed at the USAF Utah Range. Phenolic-impregnated carbon ablator (PICA), a carbon fiber preform impregnated in phenolic resin, is a modern TPS material and has the advantages of low density (much lighter than carbon phenolic) coupled with efficient ablative ability at high heat flux. It is a good choice for ablative applications such as high-peak-heating conditions found on sample-return missions or lunar-return missions. PICA's thermal conductivity is lower than other high-heat-flux ablative materials, such as conventional carbon phenolics. PICA was patented by NASA Ames Research Center in the 1990s and was the primary TPS material for the Stardust aeroshell. The Stardust sample-return capsule was the fastest man-made object ever to reenter Earth's atmosphere (12.4 km/s (28,000 mph) at 135 km altitude). This was faster than the Apollo mission capsules and 70% faster than the Shuttle. PICA was critical for the viability of the Stardust mission, which returned to Earth in 2006. Stardust's heat shield (0.81 m base diameter) was made of one monolithic piece sized to withstand a nominal peak heating rate of 1.2 kW/cm2. A PICA heat shield was also used for the Mars Science Laboratory entry into the Martian atmosphere. An improved and easier to produce version called PICA-X was developed by SpaceX in 2006–2010 for the Dragon space capsule. The first reentry test of a PICA-X heat shield was on the Dragon C1 mission on 8 December 2010. The PICA-X heat shield was designed, developed and fully qualified by a small team of only a dozen engineers and technicians in less than four years. PICA-X is ten times less expensive to manufacture than the NASA PICA heat shield material. The Dragon 1 spacecraft initially used PICA-X version 1 and was later equipped with version 2. The Dragon V2 spacecraft uses PICA-X version 3. SpaceX has indicated that each new version of PICA-X primarily improves upon heat shielding capacity rather than the manufacturing cost. Silicone-impregnated reusable ceramic ablator (SIRCA) was also developed at NASA Ames Research Center and was used on the Backshell Interface Plate (BIP) of the Mars Pathfinder and Mars Exploration Rover (MER) aeroshells. The BIP was at the attachment points between the aeroshell's backshell (also called the afterbody or aft cover) and the cruise ring (also called the cruise stage). SIRCA was also the primary TPS material for the unsuccessful Deep Space 2 (DS/2) Mars impactor probes with their 0.35 m base diameter aeroshells. SIRCA is a monolithic, insulating material that can provide thermal protection through ablation. It is the only TPS material that can be machined to custom shapes and then applied directly to the spacecraft. There is no post-processing, heat treating, or additional coatings required (unlike Space Shuttle tiles). Since SIRCA can be machined to precise shapes, it can be applied as tiles, leading edge sections, full nose caps, or in any number of custom shapes or sizes. As of 1996[update], SIRCA had been demonstrated in backshell interface applications, but not yet as a forebody TPS material. AVCOAT is a NASA-specified ablative heat shield, a glass-filled epoxy–novolac system. NASA originally used it for the Apollo capsule in the 1960s, and then utilized the material for its next-generation beyond low Earth-orbit Orion spacecraft, slated to fly in the late 2010s. The Avcoat to be used on Orion has been reformulated to meet environmental legislation that has been passed since the end of Apollo. Astronaut Andrew S. W. Thomas takes a close look at TPS tiles underneath Space Shuttle Atlantis. Rigid black LI-900 tiles were used on the Space Shuttle. Thermal soak is a part of almost all TPS schemes. For example, an ablative heat shield loses most of its thermal protection effectiveness when the outer wall temperature drops below the minimum necessary for pyrolysis. From that time to the end of the heat pulse, heat from the shock layer convects into the heat shield's outer wall and would eventually conduct to the payload. This outcome is prevented by ejecting the heat shield (with its heat soak) prior to the heat conducting to the inner wall. Typical Space Shuttle TPS tiles (LI-900) have remarkable thermal protection properties. An LI-900 tile exposed to a temperature of 1,000 K on one side will remain merely warm to the touch on the other side. However, they are relatively brittle and break easily, and cannot survive in-flight rain. In some early ballistic missile RVs (e.g., the Mk-2 and the suborbital Mercury spacecraft), radiatively cooled TPS were used to initially absorb heat flux during the heat pulse, and, then, after the heat pulse, radiate and convect the stored heat back into the atmosphere. However, the earlier version of this technique required a considerable quantity of metal TPS (e.g., titanium, beryllium, copper, etc.). Modern designers prefer to avoid this added mass by using ablative and thermal-soak TPS instead. The Mercury capsule design (shown here with its escape tower) originally used a radiatively cooled TPS, but was later converted to an ablative TPS. Thermal protection systems relying on emissivity use high emissivity coatings (HECs) to facilitate radiative cooling, while an underlying porous ceramic layer serves to protect the structure from high surface temperatures. High thermally stable emissivity values coupled with low thermal conductivity are key to the functionality of such systems. Radiatively cooled TPS can be found on modern entry vehicles, but reinforced carbon-carbon (RCC) (also called carbon-carbon) is normally used instead of metal. RCC was the TPS material on the Space Shuttle's nose cone and wing leading edges, and was also proposed as the leading-edge material for the X-33. Carbon is the most refractory material known, with a one-atmosphere sublimation temperature of 3,825 °C (6,917 °F) for graphite. This high temperature made carbon an obvious choice as a radiatively cooled TPS material. Disadvantages of RCC are that it is currently expensive to manufacture, is heavy, and lacks robust impact resistance. Some high-velocity aircraft, such as the SR-71 Blackbird and Concorde, deal with heating similar to that experienced by spacecraft, but at much lower intensity, and for hours at a time. Studies of the SR-71's titanium skin revealed that the metal structure was restored to its original strength through annealing due to aerodynamic heating. In the case of the Concorde, the aluminium nose was permitted to reach a maximum operating temperature of 127 °C/261 °F (approximately 180 °C/356 °F warmer than the, normally sub-zero, ambient air); the metallurgical implications (loss of temper) that would be associated with a higher peak temperature were the most significant factors determining the top speed of the aircraft. A radiatively cooled TPS for an entry vehicle is often called a hot-metal TPS. Early TPS designs for the Space Shuttle called for a hot-metal TPS based upon a nickel superalloy (dubbed René 41) and titanium shingles. This Shuttle TPS concept was rejected, because it was believed a silica-tile-based TPS would involve lower development and manufacturing costs. A nickel superalloy-shingle TPS was again proposed for the unsuccessful X-33 single-stage-to-orbit (SSTO) prototype. Recently, newer radiatively cooled TPS materials have been developed that could be superior to RCC. Known as Ultra-High Temperature Ceramics, they were developed for the prototype vehicle Slender Hypervelocity Aerothermodynamic Research Probe (SHARP). These TPS materials are based on zirconium diboride and hafnium diboride. SHARP TPS have suggested performance improvements allowing for sustained Mach 7 flight at sea level, Mach 11 flight at 100,000 ft (30,000 m) altitudes, and significant improvements for vehicles designed for continuous hypersonic flight. SHARP TPS materials enable sharp leading edges and nose cones to greatly reduce drag for airbreathing combined-cycle-propelled spaceplanes and lifting bodies. SHARP materials have exhibited effective TPS characteristics from zero to more than 2,000 °C (3,632 °F), with melting points over 3,500 °C (6,332 °F). They are structurally stronger than RCC, and, thus, do not require structural reinforcement with materials such as Inconel. SHARP materials are extremely efficient at reradiating absorbed heat, thus eliminating the need for additional TPS behind and between the SHARP materials and conventional vehicle structure. NASA initially funded (and discontinued) a multi-phase R&D program through the University of Montana in 2001 to test SHARP materials on test vehicles. Various advanced reusable spacecraft and hypersonic aircraft designs have been proposed to employ heat shields made from temperature-resistant metal alloys that incorporate a refrigerant or cryogenic fuel circulating through them, and one such spacecraft design is currently under development. Such a TPS concept was proposed[when?] for the X-30 National Aerospace Plane (NASP). The NASP was supposed to have been a scramjet powered hypersonic aircraft, but failed in development. SpaceX is currently developing an actively cooled heat shield for its Starship spacecraft where a part of the thermal protection system will be a transpirationally cooled outer skin design for the reentering spaceship. In the early 1960s various TPS systems were proposed to use water or other cooling liquid sprayed into the shock layer, or passed through channels in the heat shield. Advantages included the possibility of more all-metal designs which would be cheaper to develop, be more rugged, and eliminate the need for classified technology. The disadvantages are increased weight and complexity, and lower reliability. The concept has never been flown, but a similar technology (the plug nozzle) did undergo extensive ground testing. In 2004, aircraft designer Burt Rutan demonstrated the feasibility of a shape-changing airfoil for reentry with the suborbital SpaceShipOne. The wings on this craft rotate upward into the feather configuration that provides a shuttlecock effect. Thus SpaceShipOne achieves much more aerodynamic drag on reentry while not experiencing significant thermal loads. The configuration increases drag, as the craft is now less streamlined and results in more atmospheric gas particles hitting the spacecraft at higher altitudes than otherwise. The aircraft thus slows down more in higher atmospheric layers which is the key to efficient reentry. Secondly, the aircraft will automatically orient itself in this state to a high drag attitude. However, the velocity attained by SpaceShipOne prior to reentry is much lower than that of an orbital spacecraft, and engineers, including Rutan, recognize that a feathered reentry technique is not suitable for return from orbit. On 4 May 2011, the first test on the SpaceShipTwo of the feathering mechanism was made during a glideflight after release from the White Knight Two. It may be desirable to combine lifting and nonlifting entry in order to achieve some advantages... For landing maneuverability it obviously is advantageous to employ a lifting vehicle. The total heat absorbed by a lifting vehicle, however, is much higher than for a nonlifting vehicle... Nonlifting vehicles can more easily be constructed... by employing, for example, a large, light drag device... The larger the device, the smaller is the heating rate. Nonlifting vehicles with shuttlecock stability are advantageous also from the viewpoint of minimum control requirements during entry. ... an evident composite type of entry, which combines some of the desirable features of lifting and nonlifting trajectories, would be to enter first without lift but with a... drag device; then, when the velocity is reduced to a certain value... the device is jettisoned or retracted, leaving a lifting vehicle... for the remainder of the descent. The North American X-15 used a similar mechanism. 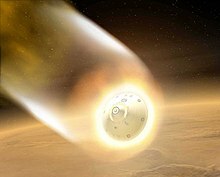 Deceleration for atmospheric reentry, especially for higher-speed Mars-return missions, benefits from maximizing "the drag area of the entry system. The larger the diameter of the aeroshell, the bigger the payload can be." An inflatable aeroshell provides one alternative for enlarging the drag area with a low-mass design. Such an inflatable shield/aerobrake was designed for the penetrators of Mars 96 mission. Since the mission failed due to the launcher malfunction, the NPO Lavochkin and DASA/ESA have designed a mission for Earth orbit. The Inflatable Reentry and Descent Technology (IRDT) demonstrator was launched on Soyuz-Fregat on 8 February 2000. The inflatable shield was designed as a cone with two stages of inflation. Although the second stage of the shield failed to inflate, the demonstrator survived the orbital reentry and was recovered. The subsequent missions flown on the Volna rocket failed due to launcher failure. NASA launched an inflatable heat shield experimental spacecraft on 17 August 2009 with the successful first test flight of the Inflatable Re-entry Vehicle Experiment (IRVE). The heat shield had been vacuum-packed into a 15-inch (380 mm) diameter payload shroud and launched on a Black Brant 9 sounding rocket from NASA's Wallops Flight Facility on Wallops Island, Virginia. "Nitrogen inflated the 10-foot (3.0 m) diameter heat shield, made of several layers of silicone-coated [Kevlar] fabric, to a mushroom shape in space several minutes after liftoff." The rocket apogee was at an altitude of 131 miles (211 km) where it began its descent to supersonic speed. Less than a minute later the shield was released from its cover to inflate at an altitude of 124 miles (200 km). The inflation of the shield took less than 90 seconds. Following the success of the initial IRVE experiments, NASA developed the concept into the more ambitious Hypersonic Inflatable Aerodynamic Decelerator (HIAD). The current design is shaped like a shallow cone, with the structure built up as a stack of circular inflated tubes of gradually increasing major diameter. The forward (convex) face of the cone is covered with a flexible thermal protection system robust enough to withstand the stresses of atmospheric entry (or reentry). Peak heat flux and dynamic pressure selects the TPS material. Heat load selects the thickness of the TPS material stack. Peak deceleration is of major importance for manned missions. The upper limit for manned return to Earth from low Earth orbit (LEO) or lunar return is 10g. For Martian atmospheric entry after long exposure to zero gravity, the upper limit is 4g. Peak dynamic pressure can also influence the selection of the outermost TPS material if spallation is an issue. Starting from the principle of conservative design, the engineer typically considers two worst case trajectories, the undershoot and overshoot trajectories. The overshoot trajectory is typically defined as the shallowest allowable entry velocity angle prior to atmospheric skip-off. The overshoot trajectory has the highest heat load and sets the TPS thickness. The undershoot trajectory is defined by the steepest allowable trajectory. For manned missions the steepest entry angle is limited by the peak deceleration. The undershoot trajectory also has the highest peak heat flux and dynamic pressure. Consequently, the undershoot trajectory is the basis for selecting the TPS material. There is no "one size fits all" TPS material. A TPS material that is ideal for high heat flux may be too conductive (too dense) for a long duration heat load. A low density TPS material might lack the tensile strength to resist spallation if the dynamic pressure is too high. A TPS material can perform well for a specific peak heat flux, but fail catastrophically for the same peak heat flux if the wall pressure is significantly increased (this happened with NASA's R-4 test spacecraft). Older TPS materials tend to be more labor-intensive and expensive to manufacture compared to modern materials. However, modern TPS materials often lack the flight history of the older materials (an important consideration for a risk-averse designer). Based upon Allen and Eggers discovery, maximum aeroshell bluntness (maximum drag) yields minimum TPS mass. Maximum bluntness (minimum ballistic coefficient) also yields a minimal terminal velocity at maximum altitude (very important for Mars EDL, but detrimental for military RVs). However, there is an upper limit to bluntness imposed by aerodynamic stability considerations based upon shock wave detachment. A shock wave will remain attached to the tip of a sharp cone if the cone's half-angle is below a critical value. This critical half-angle can be estimated using perfect gas theory (this specific aerodynamic instability occurs below hypersonic speeds). For a nitrogen atmosphere (Earth or Titan), the maximum allowed half-angle is approximately 60°. For a carbon dioxide atmosphere (Mars or Venus), the maximum allowed half-angle is approximately 70°. After shock wave detachment, an entry vehicle must carry significantly more shocklayer gas around the leading edge stagnation point (the subsonic cap). Consequently, the aerodynamic center moves upstream thus causing aerodynamic instability. It is incorrect to reapply an aeroshell design intended for Titan entry (Huygens probe in a nitrogen atmosphere) for Mars entry (Beagle-2 in a carbon dioxide atmosphere). [original research?] Prior to being abandoned, the Soviet Mars lander program achieved one successful landing (Mars 3), on the second of three entry attempts (the others were Mars 2 and Mars 6). The Soviet Mars landers were based upon a 60° half-angle aeroshell design. A 45° half-angle sphere-cone is typically used for atmospheric probes (surface landing not intended) even though TPS mass is not minimized. The rationale for a 45° half-angle is to have either aerodynamic stability from entry-to-impact (the heat shield is not jettisoned) or a short-and-sharp heat pulse followed by prompt heat shield jettison. A 45° sphere-cone design was used with the DS/2 Mars impactor and Pioneer Venus Probes. Not all atmospheric reentries have been successful and some have resulted in significant disasters. Voskhod 2 – The service module failed to detach for some time, but the crew survived. Soyuz 1 – The attitude control system failed while still in orbit and later parachutes got entangled during the emergency landing sequence (entry, descent, and landing (EDL) failure). Lone cosmonaut Vladimir Mikhailovich Komarov died. Soyuz 5 – The service module failed to detach, but the crew survived. Soyuz 11 – After tri-module separation, a valve was weakened by the blast and failed on reentry. The cabin depressurized killing all three crew members. Mars Polar Lander – Failed during EDL. The failure was believed to be the consequence of a software error. The precise cause is unknown for lack of real-time telemetry. STS-1 – a combination of launch damage, protruding gap filler, and tile installation error resulted in serious damage to the orbiter, only some of which the crew was privy to. Had the crew known the true extent of the damage before attempting reentry, they would have flown the shuttle to a safe altitude and then bailed out. Nevertheless, reentry was successful, and the orbiter proceeded to a normal landing. STS-107 – The failure of an RCC panel on a wing leading edge caused by debris impact at launch led to breakup of the orbiter on reentry resulting in the deaths of all seven crew members. Genesis – The parachute failed to deploy due to a G-switch having been installed backwards (a similar error delayed parachute deployment for the Galileo Probe). Consequently, the Genesis entry vehicle crashed into the desert floor. The payload was damaged, but most scientific data were recoverable. Soyuz TMA-11 – The Soyuz propulsion module failed to separate properly; fallback ballistic reentry was executed that subjected the crew to forces about eight times that of gravity. The crew survived. Of satellites that reenter, approximately 10–40% of the mass of the object is likely to reach the surface of the Earth. On average, about one catalogued object reenters per day. On January 24, 1978, the Soviet Kosmos 954 (3,800 kilograms (8,400 lb)) reentered and crashed near Great Slave Lake in the Northwest Territories of Canada. The satellite was nuclear powered and left radioactive debris near its impact site. On July 11, 1979, the US Skylab space station (77,100 kilograms (170,000 lb)) reentered and spread debris across the Australian Outback. The reentry was a major media event largely due to the Cosmos 954 incident, but not viewed as much as a potential disaster since it did not carry toxic nuclear or hydrazine fuel. NASA had originally hoped to use a Space Shuttle mission to either extend its life or enable a controlled reentry, but delays in the Shuttle program, plus unexpectedly high solar activity, made this impossible. On February 7, 1991, the Soviet Salyut 7 space station (19,820 kilograms (43,700 lb)), with the Kosmos 1686 module (20,000 kilograms (44,000 lb)) attached, reentered and scattered debris over the town of Capitan Bermudez, Argentina. The station had been boosted to a higher orbit in August 1986 in an attempt to keep it up until 1994, but in a scenario similar to Skylab, the planned Buran shuttle was cancelled and high solar activity caused it to come down sooner than expected. On September 7, 2011, NASA announced the impending uncontrolled reentry of the Upper Atmosphere Research Satellite (6,540 kilograms (14,420 lb)) and noted that there was a small risk to the public. The decommissioned satellite reentered the atmosphere on September 24, 2011, and some pieces are presumed to have crashed into the South Pacific Ocean over a debris field 500 miles (800 km) long. On April 1, 2018, the Chinese Tiangong-1 space station (8,510 kilograms (18,760 lb)) reentered over the Pacific Ocean, halfway between Australia and South America. The China Manned Space Engineering Office had intended to control the reentry, but lost telemetry and control in March 2017. Salyut 1, the world's first space station, was deliberately de-orbited into the Pacific Ocean in 1971 following the Soyuz 11 accident. Its successor, Salyut 6, was de-orbited in a controlled manner as well. On June 4, 2000 the Compton Gamma Ray Observatory was deliberately de-orbited after one of its gyroscopes failed. The debris that did not burn up fell harmlessly into the Pacific Ocean. The observatory was still operational, but the failure of another gyroscope would have made de-orbiting much more difficult and dangerous. With some controversy, NASA decided in the interest of public safety that a controlled crash was preferable to letting the craft come down at random. In 2001, the Russian Mir space station was deliberately de-orbited, and broke apart in the fashion expected by the command center during atmospheric reentry. Mir entered the Earth's atmosphere on March 23, 2001, near Nadi, Fiji, and fell into the South Pacific Ocean. On February 21, 2008, a disabled US spy satellite, USA 193, was hit at an altitude of approximately 246 kilometers (153 mi) with an SM-3 missile fired from the U.S. Navy cruiser Lake Erie off the coast of Hawaii. The satellite was inoperative, having failed to reach its intended orbit when it was launched in 2006. Due to its rapidly deteriorating orbit it was destined for uncontrolled reentry within a month. United States Department of Defense expressed concern that the 1,000-pound (450 kg) fuel tank containing highly toxic hydrazine might survive reentry to reach the Earth's surface intact. Several governments including those of Russia, China, and Belarus protested the action as a thinly-veiled demonstration of US anti-satellite capabilities. China had previously caused an international incident when it tested an anti-satellite missile in 2007. This list includes some notable atmospheric entries in which the spacecraft was not intended to be recovered, but was destroyed in the atmosphere. Martin, John J. (1966). Atmospheric Entry – An Introduction to Its Science and Engineering. Old Tappan, New Jersey: Prentice-Hall. Regan, Frank J. (1984). Re-Entry Vehicle Dynamics (AIAA Education Series). New York: American Institute of Aeronautics and Astronautics, Inc. ISBN 978-0-915928-78-1. Etkin, Bernard (1972). Dynamics of Atmospheric Flight. New York: John Wiley & Sons, Inc. ISBN 978-0-471-24620-6. Vincenti, Walter G.; Kruger Jr, Charles H. (1986). Introduction to Physical Gas Dynamics. Malabar, Florida: Robert E. Krieger Publishing Co. ISBN 978-0-88275-309-6. Hansen, C. Frederick (1976). Molecular Physics of Equilibrium Gases, A Handbook for Engineers. NASA. NASA SP-3096. Anderson, John D. Jr. (1989). Hypersonic and High Temperature Gas Dynamics. New York: McGraw-Hill, Inc. ISBN 978-0-07-001671-2. ^ GROSS, F. (1965). "Buoyant Probes into the Venus Atmosphere". Unmanned Spacecraft Meeting 1965. American Institute of Aeronautics and Astronautics. doi:10.2514/6.1965-1407 – via American Institute of Aeronautics and Astronautics. ^ Goddard, Robert H. (Mar 1920). "Report Concerning Further Developments". The Smithsonian Institution Archives. Archived from the original on 26 June 2009. Retrieved 2009-06-29. ^ Hansen, James R. (Jun 1987). "Chapter 12: Hypersonics and the Transition to Space". Engineer in Charge: A History of the Langley Aeronautical Laboratory, 1917–1958. The NASA History Series. sp-4305. United States Government Printing. ISBN 978-0-318-23455-7. ^ Allen, H. Julian; Eggers, A. J. Jr. (1958). "A Study of the Motion and Aerodynamic Heating of Ballistic Missiles Entering the Earth's Atmosphere at High Supersonic Speeds" (PDF). NACA Annual Report. NASA Technical Reports. 44.2 (NACA-TR–1381): 1125–1140. Archived from the original (PDF) on October 13, 2015. ^ Przadka, W.; Miedzik, J.; Goujon-Durand, S.; Wesfreid, J.E. "The wake behind the sphere; analysis of vortices during transition from steadiness to unsteadiness" (PDF). Polish french cooperation in fluid research. Archive of Mechanics., 60, 6, pp. 467–474, Warszawa 2008. Received May 29, 2008; revised version November 13, 2008. Retrieved 3 April 2015. ^ a b Fay, J. A.; Riddell, F. R. (February 1958). "Theory of Stagnation Point Heat Transfer in Dissociated Air" (PDF). Journal of the Aeronautical Sciences. 25 (2): 73–85. doi:10.2514/8.7517. Archived from the original (PDF Reprint) on 2005-01-07. Retrieved 2009-06-29. ^ Whittington, Kurt Thomas. "A Tool to Extrapolate Thermal Reentry Atmosphere Parameters Along a Body in Trajectory Space" (PDF). NCSU Libraries Technical Reports Repository. A thesis submitted to the Graduate Faculty of North Carolina State University in partial fulfillment of the requirements for the degree of Master of Science Aerospace Engineering Raleigh, North Carolina 2011, pp.5. Retrieved 5 April 2015. ^ a b Johnson, Sylvia M.; Squire, Thomas H.; Lawson, John W.; Gusman, Michael; Lau, K-H; Sanjuro, Angel (30 January 2014). Biologically-Derived Photonic Materials for Thermal Protection Systems (PDF). 38th Annual Conference on Composites, Materials, and Structures January 27–30, 2014. ^ "Equations, tables, and charts for compressible flow" (PDF). NACA Annual Report. NASA Technical Reports. 39 (NACA-TR–1135): 613–681. 1953. ^ Lighthill, M.J. (Jan 1957). "Dynamics of a Dissociating Gas. Part I. Equilibrium Flow". Journal of Fluid Mechanics. 2 (1): 1–32. Bibcode:1957JFM.....2....1L. doi:10.1017/S0022112057000713. ^ Freeman, N.C. (Aug 1958). "Non-equilibrium Flow of an Ideal Dissociating Gas". Journal of Fluid Mechanics. 4 (4): 407–425. Bibcode:1958JFM.....4..407F. doi:10.1017/S0022112058000549. ^ Overview of the Mars Sample Return Earth Entry Vehicle, NASA, accessed 29 December 2018. ^ Parker, John and C. Michael Hogan, "Techniques for Wind Tunnel assessment of Ablative Materials", NASA Ames Research Center, Technical Publication, August, 1965. ^ "Arc Jet Complex". www.nasa.gov. NASA. Retrieved 2015-09-05. ^ Di Benedetto, A.T.; Nicolais, L.; Watanabe, R. (1992). Composite materials : proceedings of Symposium A4 on Composite Materials of the International Conference on Advanced Materials – ICAM 91, Strasbourg, France, 27–29 May 1991. Amsterdam: North-Holland. p. 111. ISBN 978-0444893567. ^ Tran, Huy; Michael Tauber; William Henline; Duoc Tran; Alan Cartledge; Frank Hui; Norm Zimmerman (1996). Ames Research Center Shear Tests of SLA-561V Heat Shield Material for Mars-Pathfinder (PDF) (Technical report). NASA Ames Research Center. NASA Technical Memorandum 110402. ^ Lachaud, Jean; N. Mansour, Nagi (June 2010). A pyrolysis and ablation toolbox based on OpenFOAM (PDF). 5th OpenFOAM Workshop. Gothenburg, Sweden. p. 1. ^ Tran, Huy K, et al., "Qualification of the forebody heat shield of the Stardust's Sample Return Capsule", AIAA, Thermophysics Conference, 32nd, Atlanta, GA; 23–25 June 1997. ^ "Stardust – Cool Facts". stardust.jpl.nasa.gov. ^ "SpaceX Manufactured Heat Shield Material Passes High Temperature Tests Simulating Reentry Heating Conditions of Dragon Spacecraft". www.spaceref.com. ^ Dragon could visit space station next Archived May 1, 2012, at the Wayback Machine, msnbc.com, 2010-12-08, accessed 2010-12-09. ^ Chaikin, Andrew (January 2012). "1 visionary + 3 launchers + 1,500 employees = ? : Is SpaceX changing the rocket equation?". Air & Space Smithsonian. Retrieved 2016-06-03. SpaceX's material, called PICA-X, is 1/10th as expensive than the original [NASA PICA material and is better], ... a single PICA-X heat shield could withstand hundreds of returns from low Earth orbit; it can also handle the much higher energy reentries from the Moon or Mars. ^ Tran, Huy K., et al., "Silicone impregnated reusable ceramic ablators for Mars follow-on missions," AIAA-1996-1819, Thermophysics Conference, 31st, New Orleans, June 17–20, 1996. ^ Flight-Test Analysis Of Apollo Heat-Shield Material Using The Pacemaker Vehicle System NASA Technical Note D-4713, pp. 8, 1968–08, accessed 2010-12-26. "Avcoat 5026-39/HC-G is an epoxy novolac resin with special additives in a fiberglass honeycomb matrix. In fabrication, the empty honeycomb is bonded to the primary structure and the resin is gunned into each cell individually. ... The overall density of the material is 32 lb/ft3 (512 kg/m3). The char of the material is composed mainly of silica and carbon. It is necessary to know the amounts of each in the char because in the ablation analysis the silica is considered to be inert, but the carbon is considered to enter into exothermic reactions with oxygen. ... At 2160O R (12000 K), 54 percent by weight of the virgin material has volatilized and 46 percent has remained as char. ... In the virgin material, 25 percent by weight is silica, and since the silica is considered to be inert the char-layer composition becomes 6.7 lb/ft3 (107.4 kg/m3) of carbon and 8 lb/ft3 (128.1 kg/m3) of silica." ^ NASA.gov NASA Selects Material for Orion Spacecraft Heat Shield, 2009-04-07, accessed 2011-01-02. ^ "Company Watch – NASA. – Free Online Library". www.thefreelibrary.com. ^ Why Elon Musk Turned to Stainless Steel for SpaceX's Starship Mars Rocket, Mike Wall, space.com, 23 January 2019, accessed 23 March 2019. ^ Chapman, Dean R. (May 1958). "An approximate analytical method for studying reentry into planetary atmospheres" (PDF). NACA Technical Note 4276: 38. Archived from the original (PDF) on 2011-04-07. ^ a b c NASA Launches New Technology: An Inflatable Heat Shield, NASA Mission News, 2009-08-17, accessed 2011-01-02. ^ "Inflatable Re-Entry Technologies: Flight Demonstration and Future Prospects" (PDF). ^ Hughes, Stephen J. "Hypersonic Inflatable Aerodynamic Decelerator (HIAD) Technology Development Overview" (PDF). www.nasa.gov. NASA. Retrieved 28 March 2017. ^ Cheatwood, Neil (29 June 2016). "Hypersonic Inflatable Aerodynamic Decelerator (HIAD) Technology" (PDF). www.nasa.gov. NASA. Retrieved 28 March 2017. ^ a b c Pavlosky, James E., St. Leger, Leslie G., "Apollo Experience Report - Thermal Protection Subsystem," NASA TN D-7564, (1974). ^ William Harwood (2008). "Whitson describes rough Soyuz entry and landing". Spaceflight Now. Retrieved July 12, 2008. ^ "3-2-2-1 Settlement of Claim between Canada and the Union of Soviet Socialist Republics for Damage Caused by "Cosmos 954" (Released on April 2, 1981)". www.jaxa.jp. ^ Hanslmeier, Arnold (2002). The sun and space weather. Dordrecht ; Boston: Kluwer Academic Publishers. p. 269. ISBN 9781402056048. ^ Lamprecht, Jan (1998). Hollow planets : a feasibility study of possible hollow worlds. Austin, Texas: World Wide Pub. p. 326. ISBN 9780620219631. ^ Elkins-Tanton, Linda (2006). The Sun, Mercury, and Venus. New York: Chelsea House. p. 56. ISBN 9780816051939. ^ David, Leonard (7 September 2011). "Huge Defunct Satellite to Plunge to Earth Soon, NASA Says". Space.com. Retrieved 10 September 2011. ^ "Final Update: NASA's UARS Re-enters Earth's Atmosphere". Retrieved 2011-09-27. ^ "aerospace.org Tiangong-1 Reentry". Archived from the original on 2018-04-04. Retrieved 2018-04-02. ^ Jones, Morris (30 March 2016). "Has Tiangong 1 gone rogue". Space Daily. Retrieved 22 September 2016. ^ Gray, Andrew (2008-02-21). "U.S. has high confidence it hit satellite fuel tank". Reuters. Archived from the original on 25 February 2008. Retrieved 2008-02-23. ^ "IXV flight profile". European Space Agency. Look up Appendix:Glossary of atmospheric reentry in Wiktionary, the free dictionary. Wikimedia Commons has media related to Atmospheric entry. Apollo Atmospheric Entry Phase, 1968, NASA Mission Planning and Analysis Division, Project Apollo. video (25:14). Encyclopedia Astronautica article on the history of space rescue crafts, including some reentry craft designs.